Dr. Armstrong was born and raised in Colorado where he attended Colorado State University and received his doctorate in veterinary medicine. Recently after graduating, he moved to Florida and began practicing veterinary medicine. 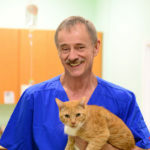 Dr. Armstrong has years of experience not only with dogs and cats but with small animals, and birds too. He is a true love for animals and has practically a zoo in his own home. His kind heart, desire for excellence in veterinary care, and his philosophy to care for each pet as his own, while offering his service at a greatly reduced rate to help his clients, makes Dr. Armstrong a rare find and quite a remarkable person and doctor.